A Great Wall | WHAT A FEELING! The selling point for A Great Wall has been its unusual pedigree: It’s an American independent feature made mostly in China. At the very least, that ought to provoke some curiosity. But it would be too bad if geography were the only reason for seeing this film. It’s quite lovely in its own, unassuming right. A Great Wall comes from director Peter Wang and producer Shirley Sun (who also collaborated on the script). The story is simple enough: A Chinese-American family decides they will finally make that long-promised trip back to the homeland, and stay with the relatives in Peking. The collision of cultures that follows forms the basis of the film’s low-key observational humor. Contradictions abound. Leo (played by Wang himself), the father of the Chinese-American family, finds Peking so Westernized and skycrapered as to be almost unrecognizable as the city of his youth. But behind the steel buildings are customs and habits that he has forgotten about, which are distinctly Chinese. Thus, Leo will surrender his yuppie jogging routine for a more intense program of silent—well, near-silent—calisthenics, as demonstrated by his brother-in-law. And his incorrigibly All-American son (Kelvin Han Yee) takes some tips on ping pong, in a game that recalls the Nixon-era China-America thaw, during which the simple game of ping pong seemed an important turning point. Wang’s main concern, about the importance of cultural identity in a world that’s becoming increasingly homogenized, is all the better suggested because he refuses to beat his breast about any of this. The story unfolds in terms that are primarily humorous, but the culture shock he portrays doesn’t descend to the level of cute East-meets-West comparisons. It’s got subtle bite. And Wang won’t go in for tired characterizations—the Chinese people are not all-knowing and wise, the Americans are not all vulgarians. Wang knows better than that. It’s a splendidly structured script, and Wang himself is a relaxed and natural performer (as he previously proved in Ah Ying). As a director, he seems reluctant to assert himself, and the film rarely slips into really memorable working motion. But there is a lot to like. Even if Wang had just achieved this single image, he would have gotten planet: the family playing touch football on the spine of the serpentine Great Wall. That scene is surprising and natural, bold and common, crude and elevated. That’s a heady mix, and difficult to capture. IMDb insists this movie is called The Great Wall Is a Great Wall, picking up on the classic Nixon line, even as it notes that A Great Wall is the “original title.” Whatever dude. 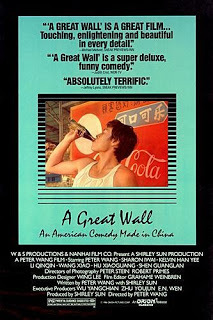 A fairly nice film that did pretty well in Seattle, as did the aforementioned Ah Ying, directed by Allen Fong. Wang’s last credit dates from 1989. This entry was posted on Tuesday, March 19th, 2013 at 3:00 am and is filed under 1986, Martial Arts. You can follow any responses to this entry through the RSS 2.0 feed. You can leave a response, or trackback from your own site.